Another of the Waterstone's 11 best debut authors of 2011. Signed, dated and located ("London") 1st edition (paperback original - no hardback issued). Synopsis : It is Kashmir in the early 1990s and war has finally reached the isolated village of Nowgam close to the Pakistan border. Indian soldiers appear as if from nowhere to hunt for militants on the run. Four teenage boys, who used to spend their afternoons playing cricket, or singing Bollywood ballads down by the river, have disappeared one by one, to cross into Pakistan and join the movement against the Indian army. Only one of their friends, the son of the headman, is left behind. The families in the village begin to think it's time to flee, to search for a place of greater safety. But the headman will not allow his family to leave. And, whilst the headman watches his dreams give way beneath the growing violence, his son, under the brutal, drunken gaze of the Indian army captain, is seemingly forced to collaborate and go into the valley to count the corpses, fearing, each day, that he will discover one of his friends lying amongst the dead. "The Colloborator" is a stunningly humane work of storytelling with a poignant and unpredictable hero at its heart. 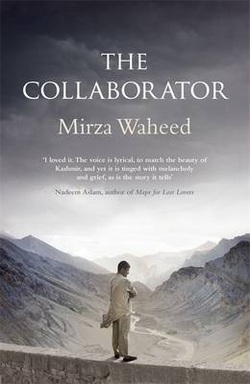 In one of the most shocking and brilliantly compelling novels of recent times Mirza Waheed lights our way into the heart of a war that is all too real.